One of the best things about doing what I do is some of the amazing people I have met. I have been really lucky through my work to meet a bunch of other party and sweet minded people who I have worked with on various projects and I can honestly say that to date I have yet to meet anyone I didn't like and quite a few of them have become friends I've worked with many times. Like Daneve from Ah-Tissue who is genuinely lovely, and oh my goodness so super talented and inspirational. 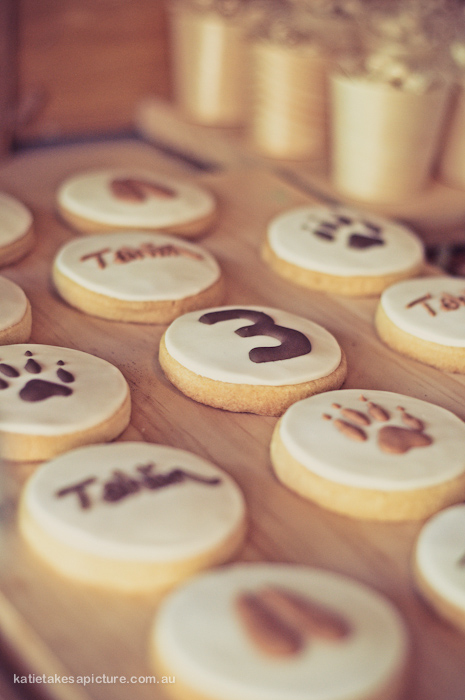 A little while back I made some cookies and cupcakes for her son's Safari party. The designs were created by Daneve and her partner to work in with the theme. The whole party was totally amazing! If you haven't seen it yet you should pop on over to her blog to see all the shots. 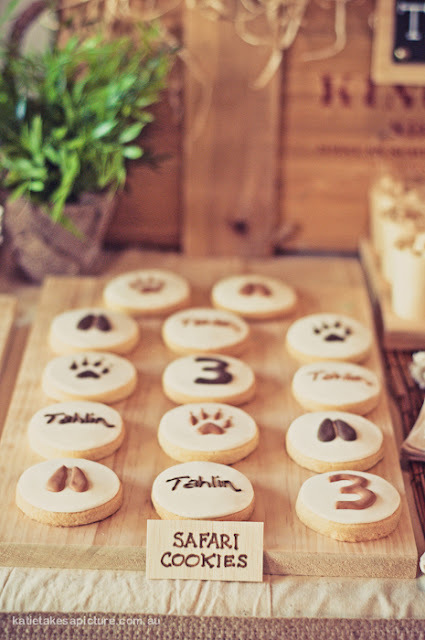 Here is the link to Tahlin's party on the Ah Tissue Blog. and the photo's used in this blog post (apart from the one in the cupcake instruction section) are by Katie takes a picture. The cupcakes were inspired by the beautiful invitations and were giraffe and zebra print disks of ready made fondant. As you want them to be firm enough to hold their shape, plan to make these a few days before the party. In ideal conditions they will firm up in a day but with humidity or rain you might need a little bit longer. Knead the fondant until pliable and add any colours then place them in a airtight container. For my safari toppers I used white background with black stripes and the giraffe was a mixture of ivory and light brown background and brown spots. Dark colours need to be made a day or so before to allow the colors to settle. (see end for black and brown fondant). Dust your workbench with a little cornflour(cornstarch) and using a small plastic rolling pin roll out the fondant until it is a few mm thick (1/8 inch). Cut out a round shape in the size you would like the cupcake toppers to be, mine were around 6.5cm (2.6"). If you don't have a suitable round cutter you can always use the rim of a glass or cup. Place the round cut shapes onto a parchment paper lined tray. Now roll out the black fondant and cut out another round shape and using a sharp knife hand cut stripes. Make them messy not just straight up and down. If you are working along the circle the stripes should kinda fit into each other like mine do. When you have enough to cover the white circle (you will not use the whole black circle) arrange them onto the white disk, if needed use a really tiny amount of water* and then roll on with the plastic rolling pin very gently so you do not ruin the circle, although if you do you could just reuse your circle cutter to even it up. Cut any excess black overhang off with a knife. *I dip my clean, for fondant use only paintbrush in the water and then dry most of it off with a paper/absorbent towel. especially when using black, red or other strong colors that easily bleed. 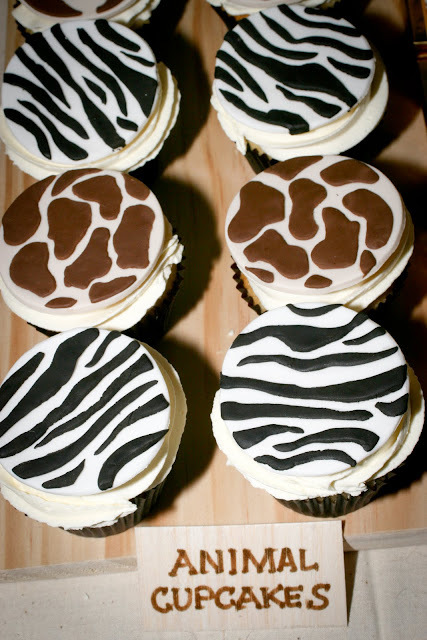 For the Giraffe print toppers, cut out a round of the ivory colored fondant, place it flat onto the parchment paper. Cut out the round of brown fondant and hand cut the spots, make them uneven and work in together. If you do not mind if the sides are not so sharply defined you could just pinch off pieces of the brown fondant and shape them into the spot shapes with your fingers which is much much faster.Adhere the spots with a small amount of water and gently press on using a plastic rolling pin. Yup really that's how I made them and it does take a long long time. Alternately you could paint on the stripes with edible black paint or food colour. Then I made up a batch of vanilla cupcakes and baked them in brown paper cases and topped them with vanilla buttercream piped in a swirl with a 1M tip. It was a flat swirl starting in the middle and working out to the edge. Toppers can be pushed carefully onto the top just before serving. I'm going to share a little trick with you on how I colour my ready made fondant black. Start with chocolate fondant, yup they make chocolate fondant which I think tastes great (I use the Bakels brand), knead until pliable and then add Americolor superblack food colour until you reach the desired color. Store at least overnight to allow the colors to set. I like this method for 2 reasons. Well technically one reason which has 2 benefits. 2. There is less risk of a bitter food color taste. Don't get me wrong it's still a messy process but you will use way less color and I think the fondant tastes waaaay better. Oh and you know if your totally sensible and your using a lot of fondant you could just buy ready made black cause they sell that as well........but then it wouldn't taste like chocolate. Just wondering if you buy your fondant colouring online or locally? I live in regional Qld and I'm at a loss to where I can buy some from? Beautiful toppers and great fondant tips! 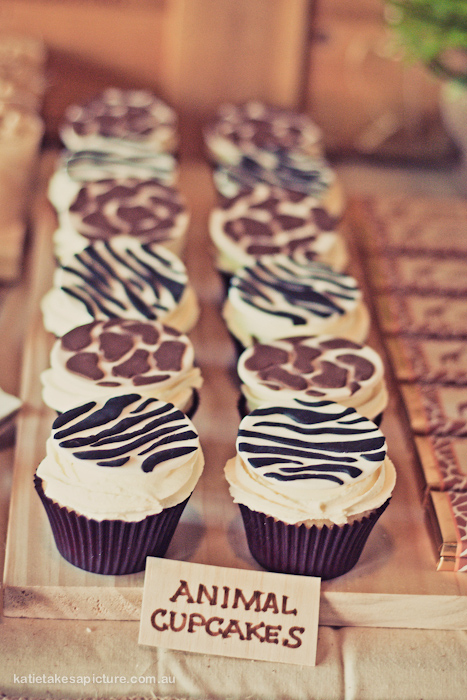 Fabulous cupcakes Linda! I'm a huge fan of fondant 'badges' (that's what I call them) - made ahead they make finishing cupcakes a breeze. So happy for you that you've found a party 'community' to work with. I live in remote/rural Qld & I get all my stuff sent out by post. I usually use Baking Pleasures or Cakes Around Town. They both have pretty reasonable postage costs. Just wanted to say I'm a new follower to your blog...and WOW!! Your work is simply stunning and I can't wait to see more! Hi! 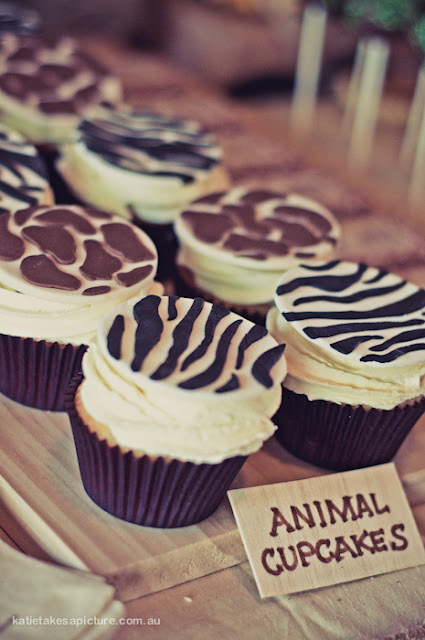 Are you interested in selling and shipping your animal print cupcake toppers to the U.S.?????? They are lovely and I would love to have them for a party I'm throwing here! I'm serious. Let me know. Thanks!